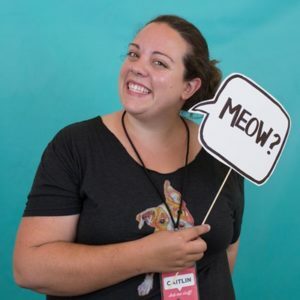 Bio: Caitlin manages operations for HeARTs Speak, a nonprofit organization dedicated to uniting art and advocacy to increase the visibility of shelter animals. She helps direct and grow core programs rooted in compassion for people & animals, collaboration between artists and animal welfare agencies, and innovation in the way we marketing our organizations & services. With the goal of helping more animals find homes and reaching new audiences for pet adoption, HeARTs Speak’s core programs aim to support and honor the work of both artists and animal sheltering staff/volunteers by providing resources and tools to help make marketing easier. Prior to joining HeARTs Speak, Caitlin was Assistant Director of Animal Farm Foundation for 6 years, where she worked on core issues in animal sheltering and advocacy for pit bull dogs, including language, marketing and policy. She has had the pleasure of presenting at national & regional conferences in animal welfare since 2009.